The band have toured the UK, France, Germany and republic of Ireland. They enjoy playing events such as Cambridge Folk Festival, Shambala, Brighton Pride, London Pride, Priddy Folk Festival and array of cool small folk festivals, theatres, dodgy bars and playhouses. Invocal's 2006 debut album ?Uneven Keel? received excellent reviews in the press and on the UK folk/acoustic scene, reviewers favouring their restless musical arrangements, heartfelt honesty, wicked wit and genuine originality. From this point the band began touring in earnest, honing their on stage performance and creating the musical tightness and energy that wows their audiences today. In 2009 the band produced another 12 track album ?I've Tried Saying No to the Slugs?. This release sees them stepping up a gear in terms of studio creativity, with tracks such as the epic Where the Gotten Go being described as ?jaw-droppingly powerful'. The album also includes the highly acclaimed live favourite ?Cheer Up, Frowny Face? ? their theatrical tragic-comic mockery of those ignorant to the issues of mental illness. When Sarah Moloney left the band shortly after this release, the band were delighted to welcome Bee Church as a new vocalist, adding a powerful new edge to the band. 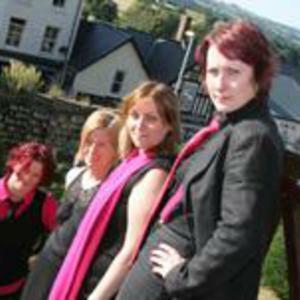 In late 2009 Invocal made their first ever, no expense spared music video for the track ?Bubblewrap', which is a must see for all fans of bubblewrap, steam trains and gingham. In 2010, Invocal continue travelling around the country performing new and classic material to their ever growing fanbase. They have just released a 5 track EP entitled ?Strange Sugar' which gives a preview of their forthcoming album, plus two songs recorded live in concert. The band are under new management and are excited to share their unique music with the whooole worrrrld! It is Invocal's combination of dark comedy, eccentric melancholy and musical theatrics that make them an unforgettable live act.